We’d love your help. 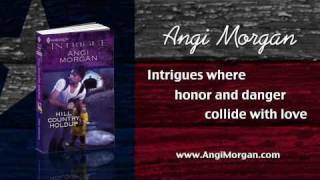 Let us know what’s wrong with this preview of Hill Country Holdup by Angi Morgan. Dr. Jane Palmer had every intention of telling FBI agent Steve Woods he was a father. But the rehearsed lines and practiced responses were forgotten the moment her little boy was kidnapped. Now, heart breaking and on the verge of falling apart, Jane needed Steve more than ever…. After every attempt at putting old feelings to rest, Steve Woods never expected Jane back in his life. Especially not for this reason. Racing against a ticking clock, desperate to earn Jane's trust, Steve still sensed Jane wasn't telling him everything. Which made him wonder why she'd come to Texas in the first place. And what it had to do with the child he'd do anything to rescue. To ask other readers questions about Hill Country Holdup, please sign up. This review has been hidden because it contains spoilers. To view it, click here. 4 Stars ~ Jane had thought they were madly in love but their whirlwind affair ended when she was offered her dream job at Johns Hopkins. She would have stayed in Dallas, but Steve wouldn't hear of it. A married-to-his-job FBI agent, he was about to go undercover for several months and wouldn't consider transferring to the Baltimore field office. Four years later, Jane returns to Dallas to introduce Steve to his son, Rory, only to find herself embroiled in a kidnapping both of Rory and another li 4 Stars ~ Jane had thought they were madly in love but their whirlwind affair ended when she was offered her dream job at Johns Hopkins. She would have stayed in Dallas, but Steve wouldn't hear of it. A married-to-his-job FBI agent, he was about to go undercover for several months and wouldn't consider transferring to the Baltimore field office. Four years later, Jane returns to Dallas to introduce Steve to his son, Rory, only to find herself embroiled in a kidnapping both of Rory and another little boy. The kidnappers are clever, using Jane as the patsy to collect the ransom demand on the other boy. But Jane is clever too, and she manages to get a message to Steve. Jane has an eidetic memory which allows her to access everything she's ever seen and with her genius IQ she's able to put what she's seen into practical use. When Steve catches up with Jane, he learns her son too has been kidnapped, but the kidnappers have made it look like she's deranged, and that she stole the other boy because Rory died several weeks before. With the FBI on Jane's tail, she and Steve have to race to find Rory and the real kidnappers. I liked this. Most Harlequin Intriques don't hold my interest but this one did. The writing was good, the characters believable and the plot was clear and logical. The bad guys were a bit unbelievably good but not totally out of the realm of possibility. I enjoyed that, even though this was a second chance at love story (my least favority story line), it was a bit different in that they didn't have a horrible breakup they just parted because they wanted different things and when an out of town j I liked this. Most Harlequin Intriques don't hold my interest but this one did. The writing was good, the characters believable and the plot was clear and logical. The bad guys were a bit unbelievably good but not totally out of the realm of possibility. I enjoyed that, even though this was a second chance at love story (my least favority story line), it was a bit different in that they didn't have a horrible breakup they just parted because they wanted different things and when an out of town job came up, they hadn't been together long enough to decide to figure out a way they could stay together. I think that is a very realistic scenario. They both had realized that breaking up was a mistake but had left too much time pass and felt they couldn't just call the other up. The heroine did have a 'secret child' by the hero. I thought that the reason that she didn't tell him was reasonable in her world view. She was a genious who didn't know how to have a relationship and she didn't deal real well with people. So she made a wrong choice. She had returned to tell him about the boy and wanted her son to know his relatives but he was kidnapped before she got the chance. The first chapter had me hooked! The suspense and story plot was very good. Jane was a scientist who was brilliant. Jane was working on a serum. Some people would do anything to get their hands on the serum that Jane was working to create. When those people kidnapped her son, she knew she needed help. She had to find Steve, and ask for his help. Steve was a FBI agent. He was also her ex. The two broke up to follow their careers, and dreams. They didn't want to hold each other back. How can they The first chapter had me hooked! The suspense and story plot was very good. Jane was a scientist who was brilliant. Jane was working on a serum. Some people would do anything to get their hands on the serum that Jane was working to create. When those people kidnapped her son, she knew she needed help. She had to find Steve, and ask for his help. Steve was a FBI agent. He was also her ex. The two broke up to follow their careers, and dreams. They didn't want to hold each other back. How can they still feel that magnetic pull, and simmering chemistry 3 years later? Steve and Jane had to work together to bring home Jane son's. Oh and the son Steve never knew he had. The kidnappers threw me for a loop. Some parts of this story had me sitting on the edge of my chair. Great book! The romance was also steamy. Sample from chapter 11- Then he slanted his face to fit hers. And he kissed her as if there wasn't enough of her to go around. As if she was the last dessert ever to be served, and a thousand people were in line for leftovers. As if he wasn't sharing. This ia a first novel. It's a fantastic book, not just as a first novel, but for any book. This author has a bright future. I was intrigued by the story. It had lots of twist & turns. I found the ending a little brief. Steve and Jane's run is still going strong as a Romantic Times Best First Series Book nominee. It's also the Romance of America 2010 Contemporary Series: Adventure/Suspense Golden Heart winner. Love this book. It's smart, full of action and mystery, and since it centers around a mother desperate to save her son and the only man who will believe her happens to be an old flame, it pulls on emotions in several different ways. I love this book... Kept me tight, all the way to the end. Debut Intrigue, and it was awesome! I took away a star for the author having the audacity to promote her web site and give it a 5-star rating on here. Fantastic! Romantic Suspense doesn't get any better than this! ANGI MORGAN's new series, BODYGUARDS IN HEELS, is a lot of her favorite reads. A little magic, a little suspense, a little comedy and a whole lot of love. Angi is a USA Today and Publisher’s Weekly best seller. Her first book, Hill Country Holdup, went on sale the very night it won the prestigious RWA Golden Heart award. She drags her dogs –and husband– around Texas for research road trips so she ANGI MORGAN's new series, BODYGUARDS IN HEELS, is a lot of her favorite reads. A little magic, a little suspense, a little comedy and a whole lot of love. She drags her dogs –and husband– around Texas for research road trips so she can write off her camera. They now have a map with highlighted roads they’ve traveled. Every detour somehow makes it into a book.